I hope everyone had a lovely Thanksgiving. We did. It was a sort of progressive Thanksgiving, dinner and dessert #1 with Howard’s aunt, uncle, and cousin, followed by dessert #2 with our friends next-door. I made this cranberry sauce recipe to bring to dinner and made a pumpkin cake for dessert with the neighbors. For French Fridays with Dorie this week, Laurie made it “Cook’s Choice”. This cook chose the Lyonnaise Garlic and Herb Cheese, subtitled Boursin’s mama by Dorie, on pages 20-21 of Dorie Greenspan’s book Around My French Table. This was supposed to be a pre-Thanskgiving snack, but I didn’t have time to make it until today, so it was the appetizer for our post-Thanksgiving turkey enchiladas. Ingredients were promising: ricotta cheese, chopped shallot, minced garlic, fresh herbs, olive oil, and a smidge of vinegar. The ricotta drains overnight to thicken it up before gently folding in the other ingredients, then letting it sit in the refrigerator for a few hours to allow the flavors to blend. Miraculously, herbs are still growing in my herb garden. I never would have expected to be able to use my own herbs on November 25. We haven’t really had a hard frost yet. The parsley is still going strong, and the chives and chervil must think it is spring because there is new growth. 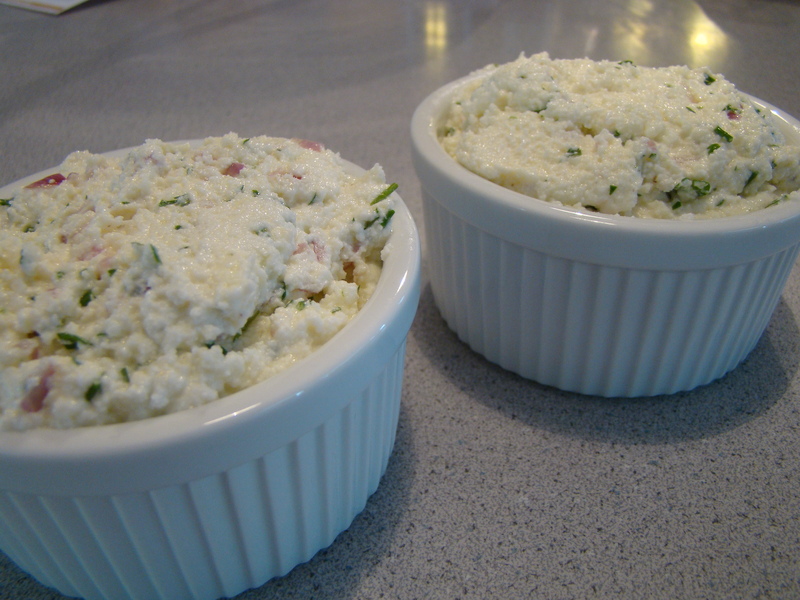 I really wanted to like this cheese spread, and I might like it better another time with some tweaks. The garlic and shallot flavors weren’t as strong as I expected, and I even added an extra clove of garlic. The cheese tasted mostly of the fresh cheese, not of the aromatics I added. I tried adding more salt, but it still didn’t boost the flavors quite enough. If I try this again, I would double the amount of both the garlic and shallot that I used, maybe the herbs too. 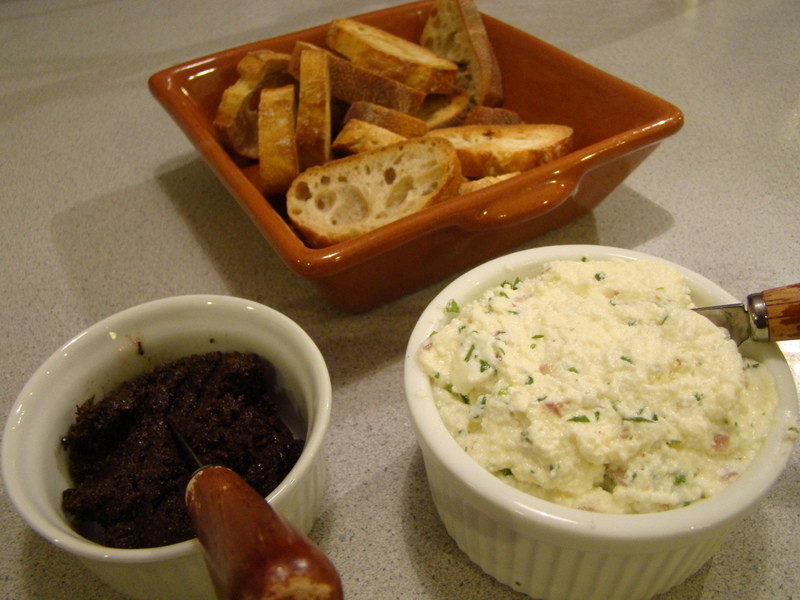 I served the cheese along with black olive tapenade with baguette toasts. Howard experimented by spreading a layer of tapenade on the toast and topped it with the cheese spread which turned out to be a winner idea. The combination of both spreads in each bite made up for the blandness of the cheese spread. I’m looking forward to reading the other Dorista’s posts this week because each cook chose their own Dorie recipe. It will give me a preview of other recipes from the book that I haven’t tried yet. If you’re interested you can find those links here. Posted on 25 November 2011, in Family, French Fridays with Dorie and tagged appetizers, cheese, cranberry sauce, French Fridays with Dorie. Bookmark the permalink. 19 Comments. Sounds like a great after turkey day dish, and the turkey enchiladas sound like a good re-purposing of the turkey. I picked the same recipe this week too! I find that since ricotta is usually very lightly salted, I needed to season the dish with more salt for the flavour to pop. I was actually happy I could still taste the cheese even with all the aromatics because I used freshly made whole milk ricotta that I bought warm from the cheesemaker. It’s too bad the dish fell short of expectations for you. I’ve made this one also (not posted it, because I ran out of light before I could take the pictures), and loved the recipe. It’s even better the day after. This is certainly a recipe I will make more in the future. I like the idea of layering this with the tapenade – gold star for Howard! Looking forward to trying this one sometime during the upcoming holiday season – will keep your thoughts regarding the salt level in mind. Dips/spreads are so perfect for this time of year….a perfect choice! Sorry it didn’t measure up but than you for the great tips. I’ll bookmark these for when I try this. It looks spectacular! So great to hear real stories of likes and dislikes. Seems like a great base idea that you can “spice” up in many ways including the brilliant idea of the tapenade. Your pumpkin cake looks beautiful. Hope you enjoy the rest of your long weekend! Your dip looks very impressive! Looking at all the different recipes everyone has chosen this week makes me realize how diverse Dorie’s book is! I can’t wait to try everything! Love your cake! 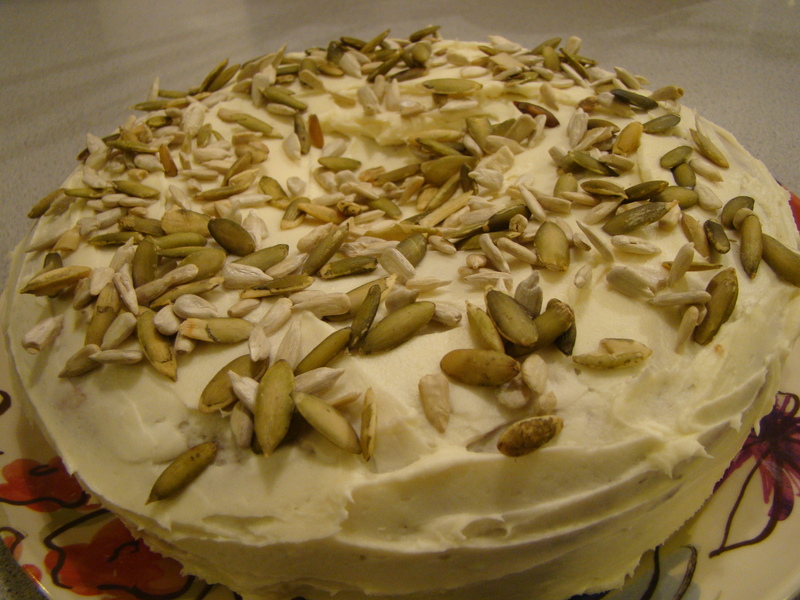 We don’t really bake with pumpkin and find cakes and muffins baked with pumpkin amazing! I found a specialty store that sells cans of pumpkin puree and can’t wait to try making something with it! I’m so impressed you still have herbs! We brought ours inside where they seem to be dying…Sorry you thought the cheese was bland. I’m going to try to remember your advice when I get around to making it! This dip sounds delicious. Great post! Btw here is the link where you can get more info on screwpine leaf aka pandan leaf and get a clear picture how the leaf looks like :) it is the vanilla of the east :) and thanks for dropping by and for your kind and encouraging comment. Glad to know you thru FFWD ! I think you’ll love the apples – we served the leftovers on pancakes & they were still great. These cheese looks great – I’m so glad you mentioned letting the flavors combine longer as this is one of the recipes I’m looking forward to trying. Good to hear, I’m looking forward to this recipe so I’m happy to read your positive review. Good tip to let it sit. Isnt it interesting how our perspective changes when we let things sit and stew and develop some more. Thanks for trying this one and reporting. 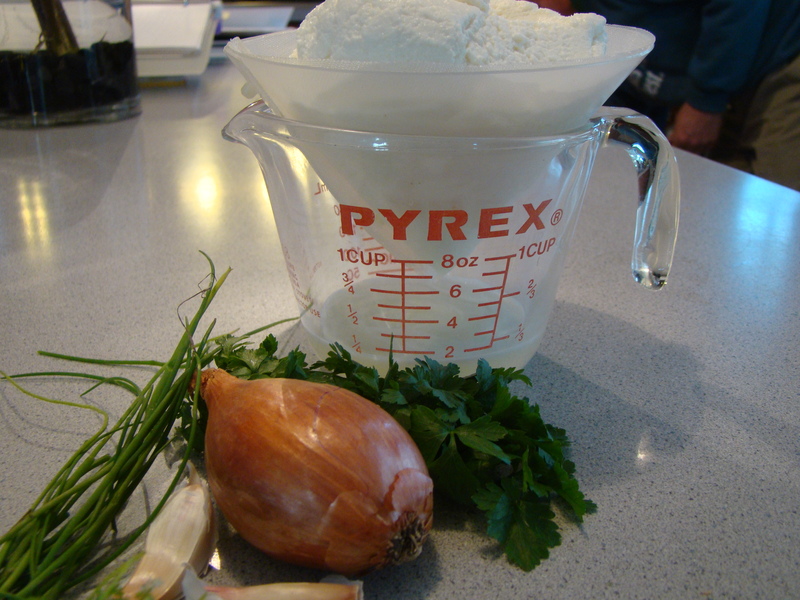 I love Boursin but this recipe didn’t stay in my memory. I’ll certainly take another look now. And what a nice Thanksgiving idea. Glad you had a nice day. Thanks for the tip to leave this cheese to sit and take on flavor a little longer. Knowing that will save us all some disappointment when we make it. This sounds like something I’d like. How wonderful that you were able to use fresh herbs from your garden in the spread. I am so glad that you updated us on how it tasted after it had set up awhile. It looks delicious and it sounds like it just takes awhile for the flavors to meld. I’m glad you had a good Thanksgiving and making turkey enchiladas with leftover turkey sounds pretty great to me. I am glad I didn’t stop where you were feeling that the cheese dip was a bit bland. I wanted to like this recipe and try it so I am happy to know that “aging” is a good-flavor-inducer. I’ll tinker with it as did Candy and try to come up with something as special as it should be. Thank you for the clear directions. Betsy, just an FYI, I’m nominating you for a Liebster Blog Award on my blog. I always find it interesting to see what someone else is doing with the same local produce. Especially when we’re preparing the same recipe! Hi, Betsy! Thank you for stopping by. It was so great to hear from you as I have missed you the last few weeks. Hope all is well with you and Howard. Have a great rest of the weekend!